81 years ago today – the 7th September 1936 – the last known thylacine died, committing its species, indeed its entire family, to extinction. It was locked out of the indoor section of its enclosure at a zoo in Hobart, and in the overnight chill of the Tasmanian winter it died of exposure. All that now remains of the then largest marsupial carnivore is in museums. 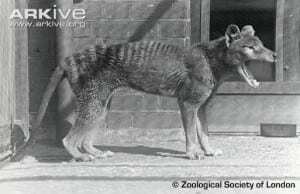 79 years ago today , on the night of 7th of September 1936, the last known thylacine died of exposure, locked out of the indoor part of its enclosure in a Tasmanian zoo. This followed a government-sponsored cull based on pressure from the farming lobby, who incorrectly blamed the thylacine for the failure of the sheep industry. Happy Thylacine Day. Here at the Grant Museum, as holders of a significant collection of specimens, we like to commemorate Thylacine Day. Here you can read how we have commemorated previous Thylacine Days – including the story of their extinction, and how it’s being echoed today in the UK’s unscientific badger cull (which restarted last Friday). Today, in Australia, is National Threatened Species Day, but far more importantly. to Grant Museumers, it’s Thylacine Day. Both of these events commemorate the ludicrously avoidable death of the last known thylacine – modern times’ largest marsupial carnivore – on 7th September 1936. 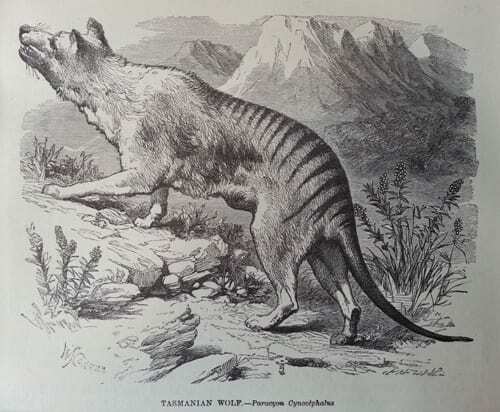 Today, for the first time, I am actually in Australia for 7th September, so in this year’s annual Thylacine Day post I’d like to explore what it is about Australian mammals that makes me go all nerdy – the shear diversity of tiny things, that on the whole people have no idea about. 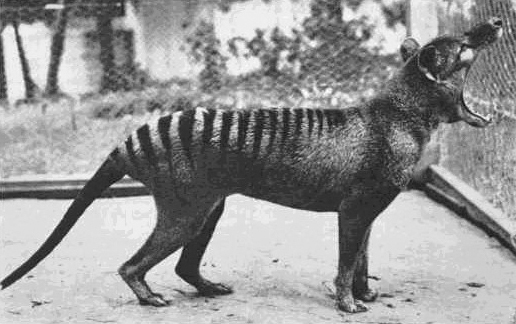 (For more on the thylacine, including why we celebate it so hard at the Grant, look through previous Thylacine Day posts on this blog). The area of zoology I am most passionate about is Australian mammals, and as a result I spend 8-10 weeks each year over here trapping animals for conservation NGOs and university research programmes. As far as I’m concerned, although there are just 378 mammal species in Australia, it’s the best fauna there is. You only have to go 50km and you might find a whole new set of mammals. Australia has a lot of things going for it, but I will shout you down if you argue that any of them outshine the wildlife and ecosystems. The thing is so few people here, or elsewhere, have ever heard of most of them. Sure, people know that kangaroos and wallabies exist – they are the national icon, but go into any business and ask what kind of wallaby is chewing on its lawn and you’ll probably get a blank response. There are 45 species of Australian kangaroo and wallaby (excluding bettongs and pottoroos). People’s lofts and gardens are pested by possums (nearly always one species – the brushtail), but there are 25 different kinds. Once you get beyond these, koalas, wombats, dingoes, platypuses, echidnas and “bandicoots” (11 species), the rest of the Australian mammalian fauna, I fear, goes largely unloved. I’m not whinging about the fact that people don’t see tiny mammals and instantly know what it is. I just want to take the time to give them a shout-out. Another year has passed since the last known thylacine – one of the greatest icons of extinction – died of exposure. That makes 76 years today. We have celebrated the thylacine here at the Grant Museum for some time. We have some fantastic specimens – including one of the only fluid preserved adults (with the added bonus of having been dissected by Victorian evolutionary giant Thomas Henry Huxley), and skeleton from the early 1800s, which belonged to Grant himself. The only recent thylacine-based activity that happened at the Museum was for all our thylacine-geek colleagues to watch The Hunter together, a film about a bounty-hunter hired to collect the last individual for an evil bio-tech company. It was brilliant. Picture this: an animal in a zoo dies of exposure one night because the door allowing it to return to the inside area of its enclosure was accidentally locked shut. It’s early Spring and southern Tasmania gets pretty cold – a wire and concrete cage is no place for a warm-blooded creature to be kept outside. Pretty awful, eh?